Project Update: In Fall 2018, we shared the final draft of a new MetroBus service plan for the St. Louis region and asked for your feedback. We listened – and we are making the final changes to the plan to address many of the responses we received, while also keeping the fast and frequent service the new plan provides. The new plan will launch in late 2019, and there are changes in place for every MetroBus route in Missouri. 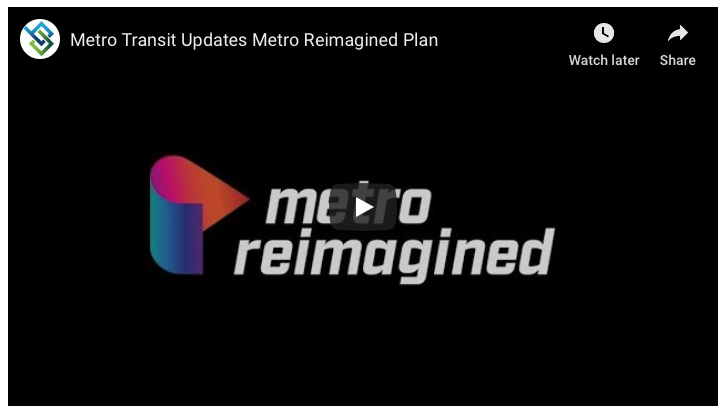 Check the updated Metro Reimagined plan below to find out how your trip will change – and let us know what you think. Learn more. Search for a specific route or click on the map below to get started. If you click on a line where two or more routes overlap, you can scroll through them by clicking on the left or right arrow at the top of the Route Information Panel. Click on any of the areas below to get details on MetroBus routes in your neighborhood. Please note Metro Reimagined will only affect MetroBus service in Missouri. At this time, no Illinois routes have been adjusted under this plan. Click here to view an accessible version of the route descriptions. Under Metro Reimagined, North St. Louis County will have 4 high-frequency routes operating every 15 minutes during the day, and 12 local routes with service every 30 minutes. Several new routes are being introduced to replace existing routes, and provide more direct trips and more frequent service. Due to low demand and ridership, MetroBus service will be discontinued in certain areas of North St. Louis County, including portions of Larimore, Trampe, Old Halls Ferry, Mullanphy, Greenway Chase, Lookaway, Coburg Lands, Landseer, Lilac, Frost, Taussig, Lackland, St. Louis Mills, parts of Earth City and Riverport Office Complex. Alternate transportation services are being explored to replace MetroBus service at the Hazelwood Industrial Park. Weekdays – operates every 30 minutes all day. Weekends – operates every 30 minutes all day. Weekdays – operates every 30 minutes during the day, every 60 minutes in the evening. Weekends – operates every 30 minutes during the day, every 60 minutes in the evening. Route will no longer serve Progress Parkway or Lackland. Weekdays – operates every 30 minutes during the day, every 60 minutes in the evening. Weekends – operates every 60 minutes all day. Route will not serve Hollywood Casino, Riverport Office Complex and north end of Earth City Industrial Park. Weekdays – operates every 15 minutes during the day, every 30 minutes during early morning and evening. Weekends – operates every 30 minutes all day. Route will operate from DePaul Hospital to Rock Road Transit Center, and will no longer serve St. Louis Mills and Hazelwood Industrial Park. Parts of #37 Hanley-Graham will be replaced by new #76 McDonnell-Waterford and #77 Village Square – N. Lindbergh routes. Route will no longer serve Hanley between Airport and Frost. Parts of #38 Hazelwood will be replaced by new #76 McDonnell-Waterford and #79 Ferguson routes, but parts of Bermuda, Woodstock, Dunn, Frost and Hazelwood Ave. will no longer be served. New transportation options are being evaluated to provide service to Hazelwood Industrial Park. Parts of #39 Berkeley-Florissant will be served by #61 Chambers and #67 Redman Patterson routes. Frost Avenue, New Florissant Road, and routing around Hazelwood Central High School will no longer be served. Weekdays – operates every 30 minutes during the day, every 60 minutes in the evening. Weekends – operates every 60 minutes all day. Route will end at North Hanley Transit Center instead of continuing to North County Transit Center. The new #72 NCTC-North Hanley route will provide service between the North Hanley and North County Transit Centers. Weekdays – operates every 30 minutes during the day, every 60 minutes in the evening. Weekends – operates every 30 minutes during the day, every 60 minutes in the evening. Route will end at Riverview Transit Center to the north, providing service between the Riverview and Rock Road Transit Centers. Route will no longer serve Hord Ave.
Route discontinued due to low ridership. New route will operate between North County Transit Center and St. Ferdinand at Washington, replacing service in areas currently served by the #39 Berkeley-Florissant and #76 Waterford. Weekdays – operates every 60 minutes during the day, every 120 minutes during the evening. Weekends – operates every 120 minutes all day. Parts of #71 Parker will be replaced by new #71 Shepley Redman and #78 Bellefontaine Parker routes, but parts of Old Halls Ferry, Lilac, Dunn and Landseer will no longer be served. New route will operate between North County Transit Center and Chambers at Bellefontaine, replacing service in areas currently served by the #61 Chambers and #71 Parker. Weekdays – operates every 30 minutes during the day, every 60 minutes in the evening. Weekends – operates every 60 minutes all day. New route will operate between North County Transit Center and North Hanley Transit Center, replacing the north end of the #47 Clayton-N.Hanley route. Weekdays – operates every 15 minutes during morning and evening rush hours, every 30 minutes during the mid-day hours. Weekends – operates every 30 minutes all day. Weekdays – operates every 15 minutes during the day, every 30 minutes during early morning and evening. Weekends – operates every 30 minutes all day. New route will operate between North County Transit Center and Gene Crayton at Spanish Pond, replacing service in areas currently served by the #78 Larimore. Weekdays – operates every 30 minutes during the morning an evening rush hours, every 60 minutes at all other times. Weekends – operates every 60 minutes all day. Will be replaced by the new #67 Redman Patterson and #76 McDonnell-Waterford routes. New route will operate between North County Transit Center and North Hanley Transit Center, replacing service in areas currently served by the #37 Hanley-Graham, #39 Berkeley-Florissant and #77 McDonnell-Lindbergh. Weekdays – operates every 30 minutes during the day, every 60 minutes in the evening. Weekends – operates every 60 minutes all day. Will be replaced by the new #67 Redman Patterson, #76 McDonnell Waterford and #77 Village Square-N. Lindbergh routes. New route will operate between North County Transit Center and North Hanley Transit Center, replacing service in areas currently served by the #77 McDonnell-Lindbergh. Weekdays – operates every 30 minutes during the day, every 60 minutes in the evening. Weekends – operates every 60 minutes all day. Will be replaced by the new #71 Shepley Lilac and #78 Bellefontaine Parker routes. New route will operate between North County Transit Center and Riverview Transit Center, replacing service in areas currently served by the #71 Parker and #78 Larimore. Weekdays – operates every 30 minutes during the day, every 60 minutes in the evening. Weekends – operates every 60 minutes all day. Weekdays – operates every 30 minutes during the day, every 60 minutes in the evening. Weekends – operates every 60 minutes all day. Service on Suburban and Dade Avenues discontinued due to low ridership. New route will operate between North County Transit Center and downtown St. Louis, replacing service in areas currently served by the #174 North Express. Will provide service on Broadway to the North Broadway Transit Center, but will no longer serve W. Florissant and Riverview. Weekdays only – operates every 30 minutes from 4 a.m. to 7 p.m.
Will be replaced by the new #84 Halls Ferry route. Under Metro Reimagined, this area of St. Louis will have 6 high-frequency routes operating every 15 minutes or better during the day, and 10 local routes with service every 30 minutes. Alternate transportation services are being explored to replace MetroBus service in downtown St. Louis, currently provided by the #96 Market Street Shuttle and #99 Downtown Trolley, and replace MetroBus service in Forest Park. MetroBus will continue to operate in these areas until new service is ready to be introduced. Due to low ridership and demand, MetroBus service will be discontinued on McLaren, Marcus, Carter and other select areas. Weekdays – operates every 30 minutes during the day, every 60 minutes in the evening. Weekends – operates every 60 minutes all day. Route will end at Mallinckrodt Center on the west, and will no longer serve McPherson, Euclid and Maryland. Weekdays – operates every 30 minutes during the day, every 60 minutes in the evening. Weekends – operates every 60 minutes all day. Route will serve Waterman between Union and Kingshighway. Will operate between the Riverview Transit Center and Delmar Loop Transit Center. Weekdays – operates every 15 minutes during the day, every 30 minutes during the evening. Weekends – operates every 30 minutes all day. Route will no longer serve Hamilton and Halls Ferry. Southern end of route between Delmar Loop Transit Center and Shrewsbury-Lansdowne I-44 Transit Center will operate on a different service frequency. Weekdays – operates every 30 minutes during the day, every 60 minutes in the evening. Weekends – operates every 60 minutes all day. Route ends at West Florissant to the north, will no longer serve North Broadway Transit Center, Carter and Marcus. Weekdays – operates every 30 minutes during the day, every 60 minutes in the evening. Weekends – operates every 60 minutes all day. Route will end at Delmar Loop Transit Center to the west, and will no longer serve the Rock Road Transit Center. Weekdays – operates every 30 minutes during the day, every 60 minutes in the evening. Weekends – operates every 60 minutes all day. Weekdays – operates every 30 minutes during the day, every 60 minutes in the evening. Weekends – operates every 60 minutes all day. Route will end at W. Florissant at Fair Avenue to the north, and will no longer serve the North Broadway Transit Center. Weekdays – operates every 10 minutes during the day, every 15 minutes during early morning and evening, and every 20 minutes after 10 p.m. Weekends – operates every 15 minutes all day. Will operate between the Forest Park-DeBaliviere Transit Center and Riverview Transit Center. Weekdays – operates every 15 minutes during the day, every 30 minutes during early morning and evening. Weekends – operates every 30 minutes all day. Route will no longer serve McLaran. Southern end of route between Forest Park-DeBaliviere Transit Center and Gravois Hampton Transit Center will operate on a different service frequency. Weekdays – operates every 15 minutes during morning and evening rush hours, and every 30 minutes at all other times. Weekends – operates every 30 minutes all day. Route will no longer serve Schuetz and surrounding areas on the west, and will access downtown via Compton and Market instead of 18th Street. Service on Market Street will be replaced by the #94 Page. Transportation options are being explored to replace bus service on Market and in downtown St. Louis with a more convenient and efficient service. Weekdays – operates every 30 minutes during the day, every 60 minutes in the evening. Weekends – operates every 30 minutes during the day, every 60 minutes in the evening. Route will no longer serve Delmar, McKnight and other areas west of Meramec Avenue. Transportation options are being explored to replace the #99 Downtown Trolley with a more convenient and efficient service. The route will remain in operation until a new service is ready to be introduced. Under Metro Reimagined, this area of St. Louis County will have 3 high-frequency routes operating every 15 minutes during the day, and 12 local routes with service every 30 minutes. Due to customer feedback, MetroBus service has been added to Schuetz and Meacham Park in Kirkwood. Due to low demand and ridership, MetroBus service will be discontinued in certain areas of West and Central St. Louis County, including portions of Warson, Woodson, Lackland, Schuetz, Progress Parkway, Clayton Road, Chesterfield Parkway, McKnight, Price, Maryland and Brentwood Boulevard. Alternate transportation services are being explored to replace MetroBus service in the Fenton/Gravois Bluffs area. Weekdays and Saturday – operates every 30 minutes during the day, every 60 minutes in the evening. Sunday – operates every 60 minutes all day. Some routing changes to make it more direct, including will end at Brentwood I-64 Transit Center to the south, and will no longer serve Eager, Richmond Heights Station, or Maplewood-Manchester Station. Route serves portions of Strassner and Hanley that are no longer served by the #59 Dogtown. Weekdays – operates every 15 minutes during the day, every 30 minutes in the evening. Weekends – operates every 30 minutes all day. MetroBus will serve this route, instead of a Metro Call-A-Ride vehicle. Weekdays – operates every 30 minutes during the day, every 60 minutes in the evening. Weekends – operates every 60 minutes all day. Route will end at North Hanley Transit Center, will no longer serve North County Transit Center. Will be replaced by new #50 Lindbergh. New route will operate between South County Mall and North Hanley Transit Center, replacing service in areas currently served by the #48 South Lindbergh and #49 North Lindbergh. Weekdays – operates every 30 minutes during the day, every 60 minutes in the evening. Weekends – operates every 60 minutes all day. Route will no longer serve the Ballas Transit Center. Will provide service between St. Louis Community College at Meramec and Shrewsbury-Lansdowne I-44 Transit Center. Weekdays – operates every 60 minutes all day. Weekends – operates every 60 minutes all day. Route will no longer serve Adams, Woodbine, Couch or parts of Lockwood. Service between Maplewood-Manchester MetroLink Station and Barrett Station Road will operate every 30 minutes during the day and every 60 minutes during early morning and evening. Service west from Barrett Station Rd. to Wildwood operates every 60 minutes all day. Will be replaced by the new #58 Clayton-Chesterfield and #65 Outer Forty. New route will operate between Clayton Transit Center and St. Louis Premium Outlet Mall, replacing service in areas currently served by the #58 Clayton-West County and #258 Clayton-Chesterfield. Weekdays – operates every 30 minutes during the day, every 60 minutes in the evening. Weekends – operates every 30 minutes during the day, every 60 minutes in the evening. Route will not serve Edison, Spirit of St. Louis and Chesterfield Parkway. Weekdays – operates every 30 minutes during the day, every 60 minutes in the evening. Weekends – operates every 60 minutes all day. Route will end at Schnucks shopping plaza in Richmond Heights on the west, and will no longer serve Kraft, Elm, Brentwood, Dale, Strassner and Lockwood. New route will operate between Ballas Transit Center and Chesterfield Parkway, replacing service in areas currently served by the #58 Clayton-West County. Weekdays – operates every 30 minutes during morning and evening rush hours, every 60 minutes at all other times. Weekends – operates every 60 minutes all day. Route will operate between Shrewsbury-Lansdowne I-44 Transit Center and Fenton. Weekdays – operates every 60 minutes all day. Weekends – operates every 100 minutes all day on weekends. Weekdays – operates every 30 minutes during the day, every 60 minutes in the evening. Weekends – operates every 30 minutes during the day, every 60 minutes in the evening. Route will not serve portions of Chesterfield Parkway and Warson, Guelbreth, Old Olive Road and Lindbergh. Weekdays – operates every 30 minutes during the day, every 60 minutes in the evening. Weekends – operates every 60 minutes all day. Route will no longer serve Bennington and McKelvey north of Dorsett. Will be replaced by the #69 Fenton-Gravois Bluffs. Will be replaced by the new #58 Clayton-Chesterfield. Renamed route will operate between Eureka and downtown St. Louis, and will provide service in areas currently served by the #410 Eureka Express. Weekdays only – operates every 30 minutes between 5:30 a.m. and 7:30 a.m., and every 30 minutes between 3:30 p.m. and 5:30 p.m. Route will no longer serve Grand MetroLink Station, will serve Central West End Transit Center and Cortex MetroLink Station instead. Weekdays only – operates every 30 minutes between 5:30 a.m. and 7 a.m., and every 30 minutes between 4 p.m. and 5:30 p.m. Route will no longer serve parts of Dale, Big Bend, Oakland and Clayton Road. Route will continue to serve Brentwood I-64 Transit Center due to customer feedback. Will be replaced by the #157 Twin Oaks Express. Renamed route will operate between Clarkson Road at Chesterfield Parkway to downtown St. Louis, and will provide service in areas currently served by the #58 Twin Oak Express. Weekdays only – operates every 30 minutes between 6 a.m. and 7 a.m., and every 30 minutes between 4 p.m. and 5 p.m. Route will no longer serve Grand MetroLink Station, will serve Central West End Transit Center and Cortex MetroLink Station instead. Will be replaced by the new #10 Eureka Express. Under Metro Reimagined, South St. Louis City and County will have 5 high-frequency routes operating every 15 minutes or better during the day, and 8 local routes with service every 30 minutes. Due to customer feedback, MetroBus service has been added back to the plan in parts of Dogtown, Shaw and along Cherokee, Laclede Station, Mackenzie, Reavis Barracks and Union. Due to low demand and ridership, and having other transit options nearby, MetroBus service will be discontinued in certain areas of South St. Louis City and County, including portions of Lafayette, Tower Grove, Morganford, Park, Russell, Macklind, Shaw, Bates, Lemay Ferry, Forder and around the Holly Hills neighborhood. Alternate transportation services are being explored to replace MetroBus service in Affton and in other neighborhoods on the southern end of the MetroBus service area. Parts of #8 Bates-Morganford will be replaced by new #8 Shaw-Cherokee-Broadway. Portions of Russell, Morganford and the Holly Hills neighborhood will no longer be served due to low ridership. New route will operate between Central West End Transit Center and Catalan Loop Transit Center. Route will serve Shaw neighborhood, Cortex MetroLink Station, Tower Grove neighbhorhood, part of Cherokee currently served by the #73 Carondelet, and part of Broadway currently served by the #20 S. Broadway. Weekdays – operates every 30 minutes during the day, every 60 minutes in the evening. Weekends – operates every 60 minutes all day. New route will operate between Shrewsbury-Lansdowne I-44 Transit Center and Telegraph at Baumgartner. Service between Shrewsbury Transit Center and Catalan Loop will operate on weekdays every 30 minutes during the day and every 60 minutes in the early morning and evening, and every 60 minutes all day on weekends. Service between Catalan Loop and Telegraph at Baumgartner will operate every 60 minutes all day on weekdays. Service between Shrewsbury Transit Center and Telegraph at Baumgartner will operate every 60 minutes all day on weekends. Weekdays – operates every 15 minutes during the day, every 30 minutes during early morning and evening. Weekends – operates every 30 minutes all day. Route will no longer serve Market Street. Will operate between the Delmar Loop Transit Center and Shrewsbury-Lansdowne I-44 Transit Center. Weekdays – operates every 30 minutes all day. Weekends – operates every 30 minutes all day. Northern end of route between Delmar Loop Transit Center and Riverview Transit Center will operate on a different service frequency. Will be replaced by new #17 Mackenzie. New route will operate between Shrewsbury-Lansdowne I-44 Transit Center and South County Mall. Weekdays only – operates five trips in the morning and in the afternoon, every 60 minutes. Will serve Green Park Industrial Drive once in the morning and once in the evening to serve Heartland Industries. Route will not serve Sappington Barracks or Telegraph. Parts of #20 Broadway will be replaced by the new #8 Shaw-Cherokee-Broadway, #9 River Des Peres and #73 Carondelet. Weekdays – operates every 30 minutes during the day, every 20 minutes during the evening rush hour, and every 60 minutes during early morning and evening. Weekends – operates every 60 minutes all day on weekends. Weekdays – operates every 30 minutes during the day, every 60 minutes in the evening. Weekends – operates every 60 minutes all day. Due to customer feedback, this route will continue to serve the Shrewsbury-Lansdowne I-44 Transit Center. Weekdays – operates every 30 minutes during the day, every 60 minutes in the evening. Weekends – operates every 60 minutes all day. Route will be extended to Maplewood Commons on the west. Weekdays – operates every 60 minutes all day. Weekends – operates every 60 minutes all day. Sunday service has been added. Weekdays – operates every 30 minutes during the day, every 60 minutes in the evening. Weekends – operates every 60 minutes all day. Route will end at Schnucks shopping plaza in Richmond Heights on the west, and will no longer serve Elm, Brentwood and Dale. Weekdays – operates every 15 minutes during the day, every 30 minutes during early morning and evening. Weekends – operates every 30 minutes all day. Routing changes from Civic Center Transit Center to Meramec will make service more direct. Areas no longer covered by the #73 are served by another route or are within a half-mile of high-frequency, 15-minute bus service. Route discontinued due to low ridership. The new #8 Shaw-Cherokee-Broadway will provide service to parts of this route in the Tower Grove and Shaw neighborhoods. Will operate between the Forest Park-DeBaliviere Transit Center and Hampton-Gravois Transit Center. Weekdays – operates every 30 minutes all day. Weekends – operates every 30 minutes all day. Northern end of route between Forest Park-DeBaliviere Transit Center and Riverview Transit Center will operate on a different service frequency. Replaced by the new #73X I-55 Express. Renamed route will service areas currently served by the #40X I-55 Express. Weekdays only – operates five morning and evening trips every 30 minutes. Route will end at South County Mall, will no longer provide service farther south to Meramec Bottom Road due to low ridership.